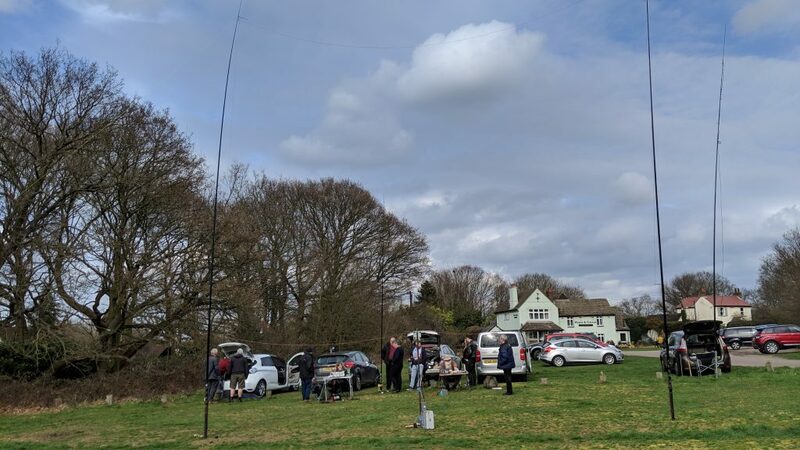 The weather looked reasonable, so @essexham suggested it would make a nice afternoon for a ham based meet up at Gallywood Chelmsford. Essex Ham is a virtual club, great for like minded local hams to meet up and experiment. I opted for my usual setup, 12m fibreglass pole and a 4m slim jim antenna. The slim jim is a tried and tested design, and made from 450 ohm ribbon feeder, although other designs are available. The antenna can be rolled up and easily transported to site. It was interesting to work G1NOX Mel in Dartford, M6OVN/P Glyn near Winchester, M1ECC Dave in Basildon, M0FAQ Martin in Great Notley and G7UTB Jim in Rochester. Glyn M6OVN/P was 72 miles away, not a bad VHF contact. Various poles with people trying out different antenna configurations.